The black HBCU coaches attending the 2016 Summer Olympics had 99 problems to worry about in preparing for Brazil. But the Zika virus isn’t one. There are at least three coaches representing historically black colleges and universities in Rio de Janeiro this week, anticipating the start of track and field competition Friday. Those coaches are George Williams, head track coach and athletics director at the Central Intercollegiate Athletic Association’s (CIAA) St. Augustine’s University in Raleigh, North Carolina; Maurice Pierce, head track coach at the Mid-Eastern Athletic Conference’s (MEAC) Hampton University in Hampton, Virginia; and Lenox Graham, head track coach of the CIAA’s Johnson C. Smith University in Charlotte, North Carolina. Those many worries leading up to the games have included travel, crowds, accommodations, the seemingly endless preparations, the time change and the huge anticipation for their athletes to achieve successes that they worked their entire lives to achieve. And for Williams, a senior statesman among Olympic track coaches: Which friends, colleagues and former athletes will show up to renew old acquaintances? That’s the best part of the Summer Games for Williams, who coached the 2004 U.S. men’s Olympic track and field team in Athens, Greece, and was assistant coach of the 1996 team in Atlanta. “It’s like a reunion for me; the fun part of it is seeing the former athletes,” he said, naming some of the more prominent former athletes he expects to see. Williams and the athletes share a mutual respect. “They have a lot of admiration for me, as I do for them,” Williams said. Williams has coached more than 40 Olympians and 30 gold-medal winners through the years. Yet, perhaps his best shot for a medal this year coming into the trials was Raleigh native Johnny Dutch, a 400-meter hurdler who appeared to be cruising toward an Olympic berth before striking the final hurdle in the U.S. Olympic trials and failing to qualify. Williams paused when asked to name the top athletes whom he helped train over the years. “Edwin Moses [400-meter hurdler out of Morehouse College] and Carl Lewis [sprinter and long jumper] would certainly be on the list,” he said. For the 2016 Summer Games, Williams’ athletes and former athletes connected to St. Augustine’s include: Tia-Adana Belle (400 hurdles), Burkheart Ellis Jr. (the 200) and Ramon Gittens (the 100 and 200), all competing for Barbados, and Roxroy Cato (the 400) for Jamaica. 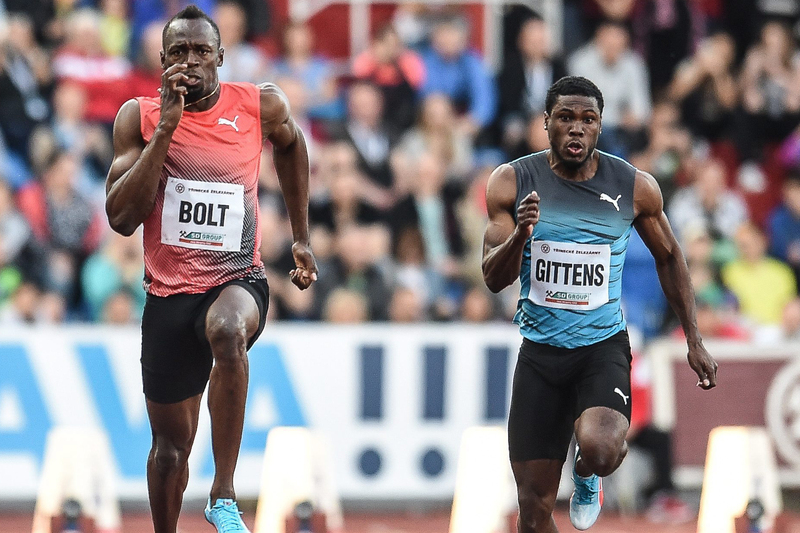 (L-R) Usain Bolt of Jamaica and Ramon Gittens of Barbados in action during the men’s 100-meter race at the IAAF World Challenge Golden Spike meet in Ostrava, Czech Republic, on May 20. Williams said it’s unfortunate that Zika has dominated headlines leading up to these Summer Games. “I think our organizers have done a great job to try to understand the problem,” he said. “And they have presented us with the necessary precautions. “The games are in a beautiful city that has a lot going on. … A lot of people are talking about crime. You don’t have to go to Brazil to find crime. Go to any of our big cities [in the United States]. Pierce too expressed confidence in the International Olympic Committee and U.S. organizers and in their ability to safeguard the contingent of coaches and athletes from around the world. “You’re concerned because you read about it all the time. It’s been in the news almost every day for the past year. Pierce is more concerned about representing Hampton University and the United States in the best manner possible. “It’s an honor and a blessing to be going to my third Olympics,” said Pierce, who coached athletes in Beijing in 2008 and London in 2012. Pierce serves as the personal coach for two former Hampton University athletes: Francena McCorory, who is on the 4-x-400 relay team for the United States, and Yvette Lewis, who will run the 100 hurdles for Panama. Also for Hampton, alum Brandon Jones is competing for Belize in the 200. 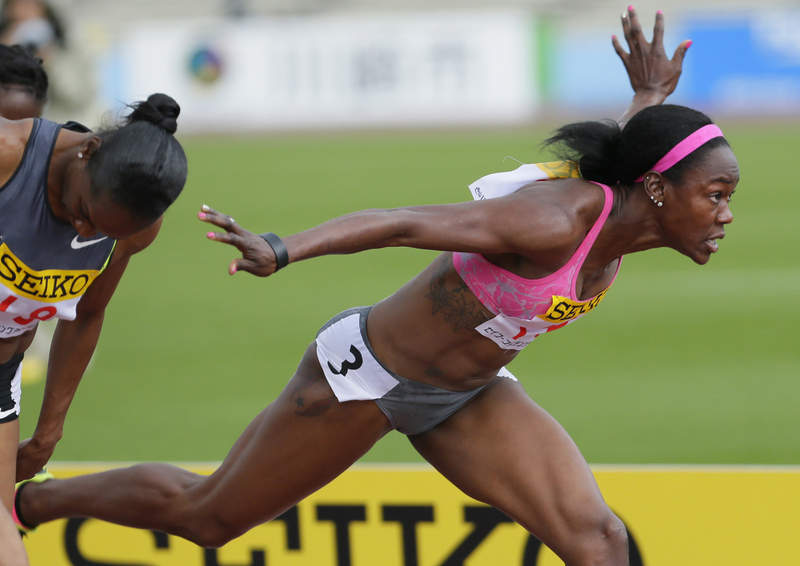 Yvette Lewis of the United States crosses the finish line in the women’s 100-meter hurdles at the Golden Grand Prix in Kawasaki, Japan, on May 6, 2012. Lewis clocked 13.08 seconds and won the race. Pierce also served as a consultant with Liberia’s Olympic team for the 2008 Olympics. Of his past medalists, Pierce coached David Payne, who earned a silver medal in the 100 hurdles at the 2008 Olympics. McCorory earned a gold medal in the 4-x-400 relay at the 2012 Olympics. Pierce was also the college coach of 2012 bronze-medal hurdler Kelli Wells, a Hampton graduate, although he was not her personal coach for the London Games. Graham, at Johnson C. Smith, is the novice among the HBCU track coaches in Rio. But he is the only one with official Olympic team duties. A native of Jamaica, Graham is serving as an assistant coach for the Jamaican national team, which features Usain Bolt, otherwise known as the world’s fastest human, though lately he’s been slowed by a hamstring injury. Johnson C. Smith will also be represented by Shermaine Williams (hurdles) for Jamaica and Kendra Clarke (4-x-400 relay) for Canada. Savannah State University’s Thierry Sawadogo is competing in swimming for his native Burkina Faso. Ash often gets overlooked among the HBCU contingent because, after winning the NCAA indoor and outdoor hurdles championship in 2009 as a sophomore for the Wildcats, he transferred to Oklahoma. Another HBCU connection often overlooked is USA golfer Patrick Reed, whose school, Augusta State, competes in golf in the MEAC. Reed was added to the U.S. team after Dustin Johnson (No. 2 in the world) and Jordan Spieth (No. 3 in the world) opted out over concerns about the Zika virus. Southwestern Athletic Conference performers include former Jackson State University standout Michael Tinsley in the 400 hurdles for the United States. He won a silver medal in the 2012 London Games. Also, Jackson State alumnus Anaso Jobodwana is competing in his second-straight Olympics, competing for South Africa after settling for eighth place as a sophomore in the 200 finals in London. From the Southern Intercollegiate Athletic Conference, Stillman College’s Jeff Henderson is competing for the United States in the long jump, and Claflin University’s Brandon Valentine-Parris is competing in the 400 for his native St. Vincent and the Grenadines. The athletes and coaches are not the only HBCU-Rio connections. The U.S. track and field team’s final tuneup for the Rio Games took place at Prairie View A&M University, near Houston. Track and field events get underway today.